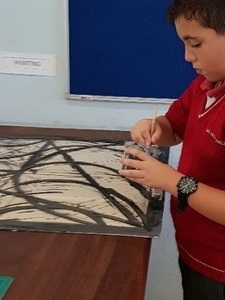 It was about a year ago that Ms Lorraine Buttigieg, a physics teacher in our school, applied for the above project, funded by the Arts Council Malta. The students, teachers, LSEs and the creative practitioner worked long hours for this project to be finalised. 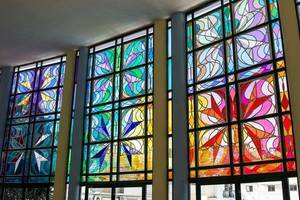 In fact, back in October 2017, the students of the XL Achieve Year 9 made a research on what is stained glass as an introduction to this project and made a chart. 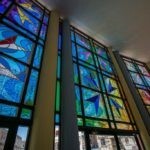 Then the whole school population was shown a powerpoint on what is stained glass and how it is made. 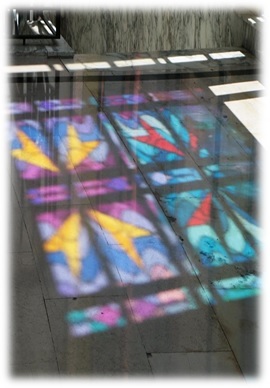 The optical science behind the stained glass was explained. Then they were shown a safe way on how to do this kind of artwork using filters and aluminium foil instead of glass and soldering. 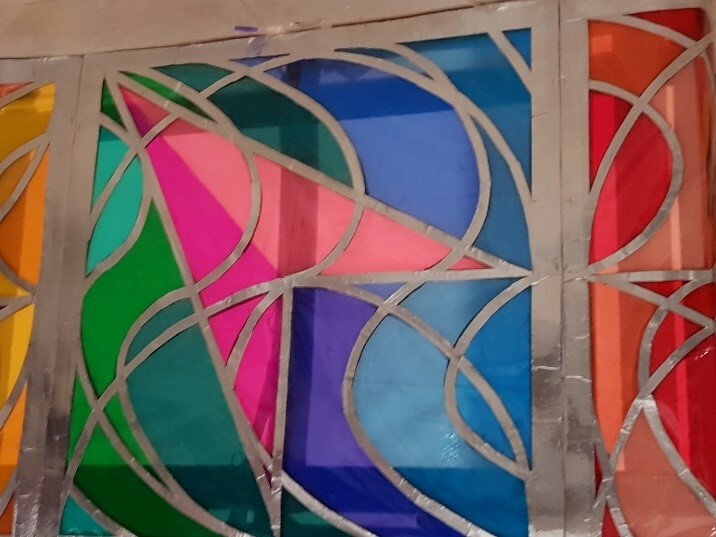 The interested students were then asked to improvise and design their own stained glass replicas under a certain theme that they chose under the guidance of the creative practitioner. The theme chosen was a modern version of the 8 pointed cross of the Knights of St John, with different colours ranging throughout the whole spectrum. 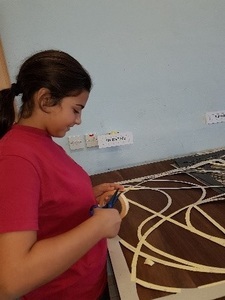 Mr Carmel Azzopardi built up a stencil and the students used it to create the whole design. Then they cut the spaces in the design to fill them with coloured filters. They painted the cardboard black and stuck double-sided tape to which they attached the filters. This work was becoming so eye catching that the Art teacher, and the one who directs the Christmas Pantomime at school, suggested that we start installing the art works under the stage so that they can be appreciated during the panto shows. But this was not enough! In December 2017, Ms Buttigieg, together with the creative practitioner applied for the Valletta 2018 endorsement which was granted immediately. Mr Azzopardi felt that he should add something else to this project. He decided to design the panoramic profile of the Valletta peninsula as seen from Fort St Elmo to Marsamxetto Harbour and to stick this profile using aluminium tape on top of the original design. This was the hardest part and the one which took the longest time. 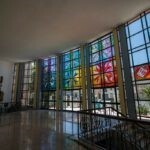 But the final product is so eye catching, both from inside the school as well as from outside. The choice of colours was influenced by science. The aim was to show the full spectrum of white light into the colours of the rainbow when dispersed through a prism. But these colours also mean the energy in the students attending this school. The students took part in this project on their own initiative, without being forced to do so. So they felt part of the project and felt also part of the school. In the meantime, all the participants in this project, worked as though they were working in a small entrepreneurship. Work was divided into teams, teamwork was part and parcel of the project. Everyone was responsible for the part he/she was doing. The students were also wearing protective clothes when they were doing dangerous work like cutting with blades. This project was cross-curricular. Physics was one of the main subjects involved where the students were shown how white light enters coloured filters and which colours will be absorbed and which will be reflected. Rotational symmetry and area were the mathematical parts of the project. Students also learnt how to reduce waste and make the maximum use of the resources available. They also learnt new skills like using blades to cut. 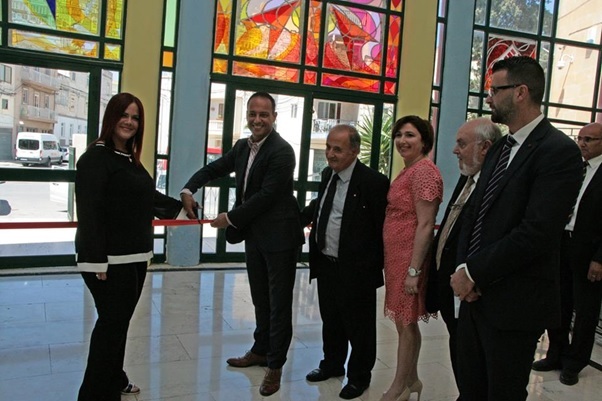 This project was officially inaugurated on Monday 7th May 2018 by Mr Jason Micallef (Chairperson of Valletta 2018 Foundation) together with Mr Albert Marshall (Chairperson of Arts Council Malta). 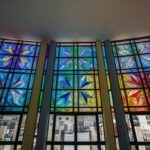 This project can be enjoyed during daytime by the students and educators during school hours and even after school hours by the Hamrun community and passers by as it is illuminated from inside for dark hours. 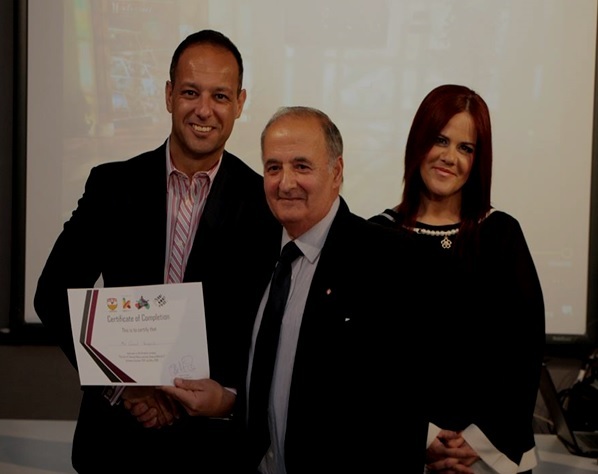 Foundation Valletta 2018 Chairman Mr Jason Micallef, Head of School Ms Doriann Portanier Mifsud, Ħamrun Local Council Mayor, Mr Christian Sammut, Creative Practitioner, Mr Carmel Azzopardi together with teachers, LSEs and students who worked on this project. Light from the sun, being reflected through the coloured filters, creates a beautiful, colourful design on the floor and walls of the school foyer.